After Cassini, What’s Next for the Outer Planets? It was big news when the Cassini mission met its dramatic end at Saturn last month. 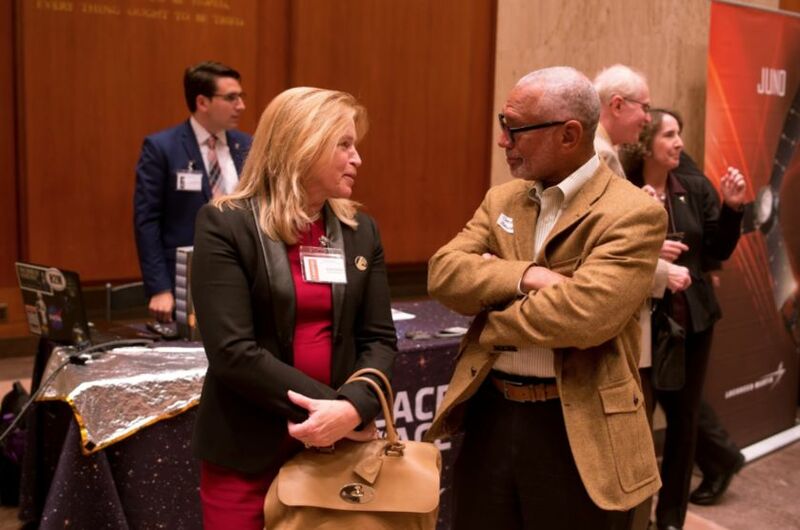 But The Planetary Society likes to look ahead, and in that spirit we organized a reception at the Library of Congress to bring scientists, legislators, and their staff together to honor Cassini and get excited about our future in the outer planets. Ellen Stofan, the former NASA Chief Scientist, addressed over 150 attendees in the James Madison Memorial Building of the Library of Congress. Our exhibitors had the opportunity to share their roles in upcoming missions, from James Webb to New Horizons to Juno to Europa Clipper. And four members of Congress were able to join us that day to learn about the scientific opportunities in the outer planets. 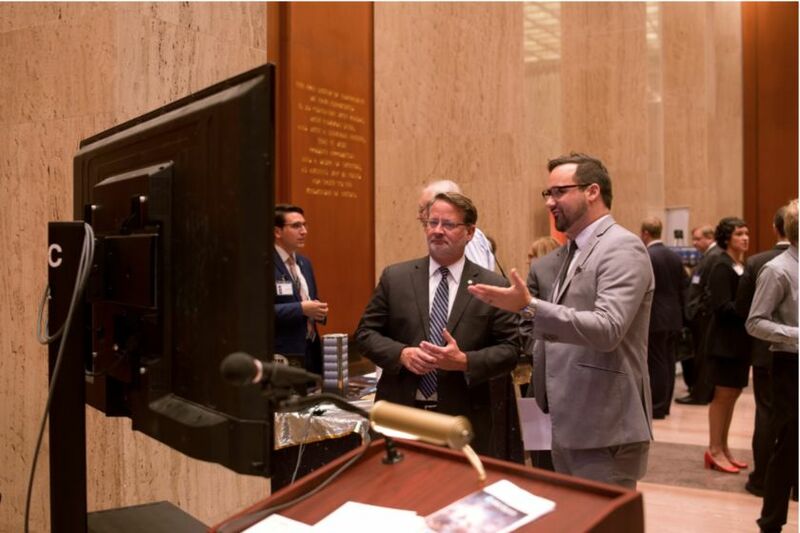 Senator Gary Peters (D-MI) learns about LightSail with The Planetary Society’s Senior Manager of Government Relations, Matthew Renninger. These events are an important part of our work in Washington, D.C. Not only does it allow members of Congress and their staff to engage directly with scientists, but it helps generate excitement, inspiration, and engagement for the possibilities that lie before us in the outer planets. Getting people excited about the upcoming Europa Clipper mission will help build interest in potential missions to the ice giants of Uranus and Neptune. We wanted to send a message: Cassini may be done, but the future is full of opportunity, and that future depends on decisions we make today. It is only because of the support from our dedicated membership that The Planetary Society is able to organize educational events like this in Washington, D.C. We have been able to grow our staff and commit additional resources due to our donors and supporters, which allows us to be even more nimble and active in the U.S. capitol while we promote space science and exploration. The Planetary Society in D.C. is fortunate to have highly dedicated volunteers, and we could not have put this event together without them. In particular, Antonio Peronace and our D.C. volunteer coordinator Jack Kiraly committed extraordinary amounts of time and energy making this event a success. This might be a good place to remind everybody that JUNO is still orbiting Jupiter and sending valuable data. Messy: Indeed we did. Lockheed-Martin was one of our exhibitors at the event, and Juno was a big part of their display. I am a troubleshooter by trade and look at most situations with a kind of mental flow chart. 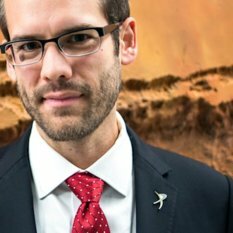 The fault in this "system" called Space Exploration is a myth of scarcity. It is considered a given there are very limited resources. This is a false premise. Scientists are shooting themselves in the foot by not taking the long view and working toward a "hands-on" solution. If you want to explore the outer solar system then don't keep fighting for these robot probes. Actually go there yourself. Think of it this way: there are a couple hundred tons of bomb grade fissionable material in various stockpiles around the planet. A few kilograms of this stuff can be used to light off a hydrogen bomb that can push thousands, actually, tens pr even hundreds of thousands of tons of spaceship very efficiently through space. Ask Freeman Dyson about it. The SLS has a powerful Launch Abort System that can transport suitably packaged bomb pits to the vicinity of the Moon- which has the ice for the thousand-ton cosmic ray water shields necessary to protect humans on multi-year missions. And the nuclear powers need deep space to base their nuclear forces since they have all become vulnerable on Earth.......see how that works? I would add the inspiration for young people you talk about in the video is going to have a much broader appeal by answering many problems at once. Building spaceships would begin with putting shielded human-crewed platforms in GEO to replace the satellite junkyard. Problem 1 solved. The spaceships would allow the superpowers to place their strategic nuclear arsenals in deep space and ratchet down the present launch-on-warning situation. Problem 2 solved. Such spaceships would also be able to deflect any comet or asteroid impact threat and thus provide planetary protection. Problem 3 solved. And lastly scientists could of course hitch rides to those planets and study them and that would solve the original problem.